I know it's technically not Spring yet but the weather's warming up and I'm a bit impatient. I found this lovely long skirt while rummaging through the wardrobe. I think it belongs to my sister (thanks sis!) and I really adore the olive green colour. So I came up with a very down-to-earth safari-inspired look in anticipation of Spring. The safari look is very easy to do. 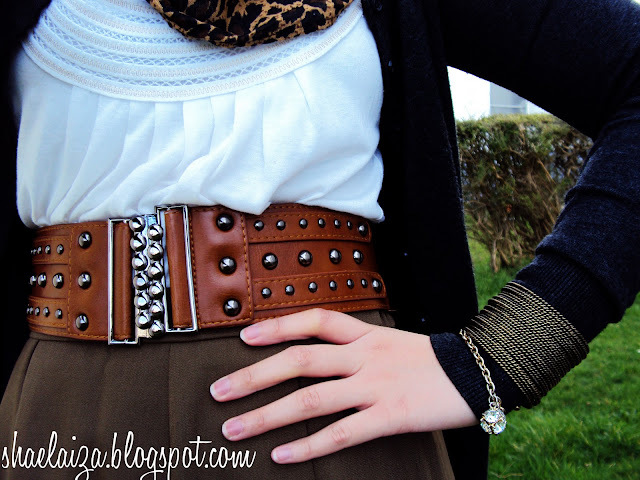 Just wear brown or khaki green and add some animal print to the ensemble. To spice things up I wore red on my lips. I love the classic ruby lips. I actually really love this look! Just recently I bought 3 different animal print scarves in 3 different colours and I'm so excited! I still have to get one in the original colours though ahah, it's on my list! You should definitely wear them more often1! and a high waisted skirt. My torso's too short and my skin is too pale, lol. Congrats to you for pulling it off! 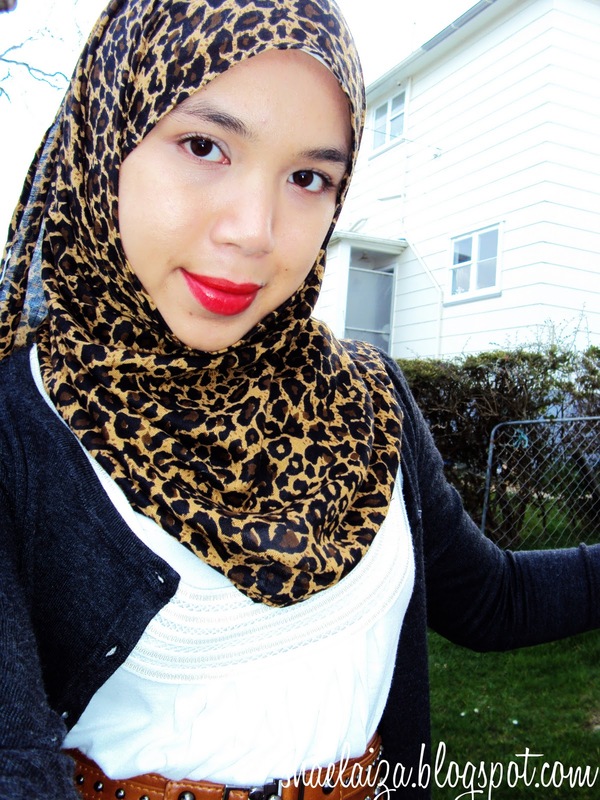 ive never really tried a proper animal print scarf. always think i wouldnt be able pull it off. i love urs though! ur working this look my deary! We're starting to get fall. You look gorgeous! Loving the animal print scarf. 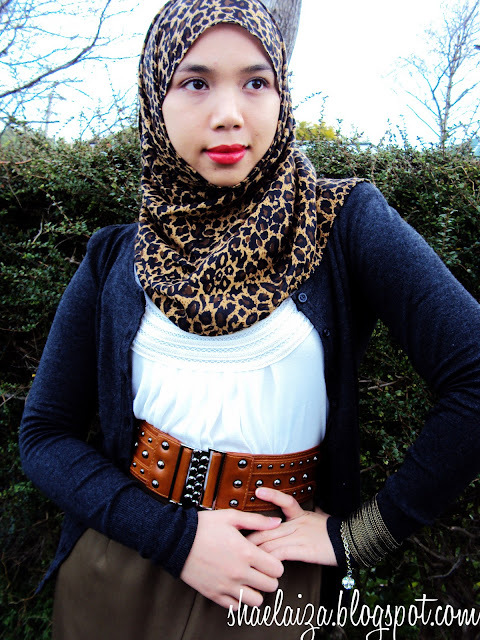 Shahirah, you so need to enter my Muslimah Style competition! BEAUTIFUL! love this outfit and the makeup, suits you well! Love your pics as well!! hijabi hippie hypo: Thanks, I had fun coming up with this outfit! Ashi: Are you serious? You have to try it one of these days! You don't have to wear anything bold, just a lightly printed animal print scarf would do. If I can pull it off, you can too. ajjah: Thank you! Btw, the biggest mistake anyone makes is not believing. Anybody can wear red lipstick =) You must try it. Perhaps go to a make up counter and get some professionals to pick the right shade for you. Urooba: Yay! Urooba approves lol. Smiley: Thank you darlin'. Nope I didn't do a close up on the shoes, I forgot. But will do next time hehe. Jana: Oooh I just might =) Thanks sis. Feda: Shukran hun =) That means a lot coming from a professional photog like you!